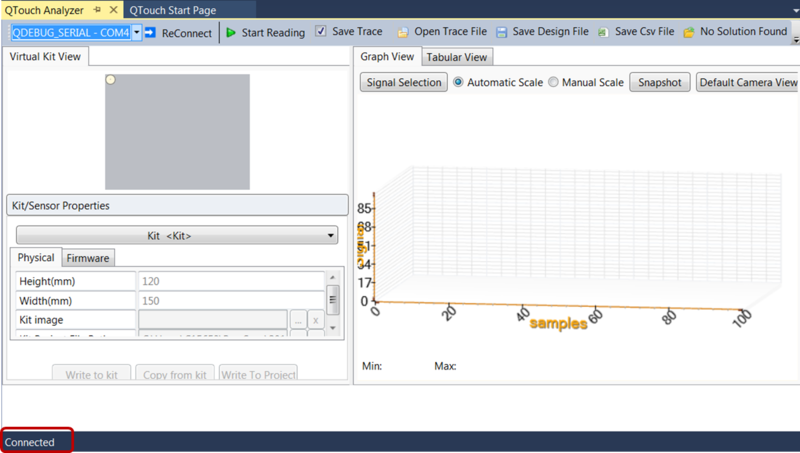 QTouch® Analyzer, which is part of QTouch Composer, provides near real-time visualization of QTouch measurement data. QTouch Analyzer can be used throughout the different phases of a development cycle. 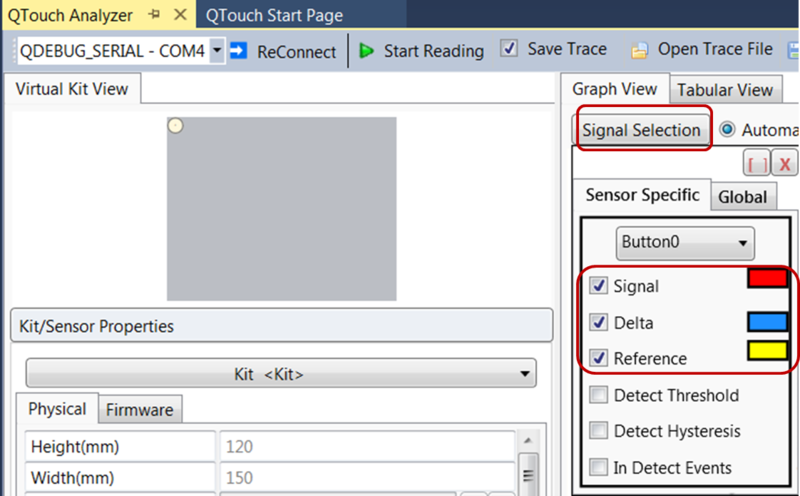 Using the basic touch sensor debugging information provided by QTouch Analyzer, it is possible to analyze sensor signal and touch delta. This debugging information can be used to appropriately tune sensor parameters such as Gain, Filter Level, Detect Threshold, and global parameters such as Drift Rates. The basic touch sensor debugging information is categorized into Signal, Reference, and Delta. Signal: Raw measurement value of a channel. This value increases with touch as shown. Reference: Long term average measurement on a channel. This tutorial builds on the Intro to PTC project. Make sure you've completed that before continuing with this project. The ATmega328PB Xplained Kit connected through QDebug can be seen in the Connected Kits pane. 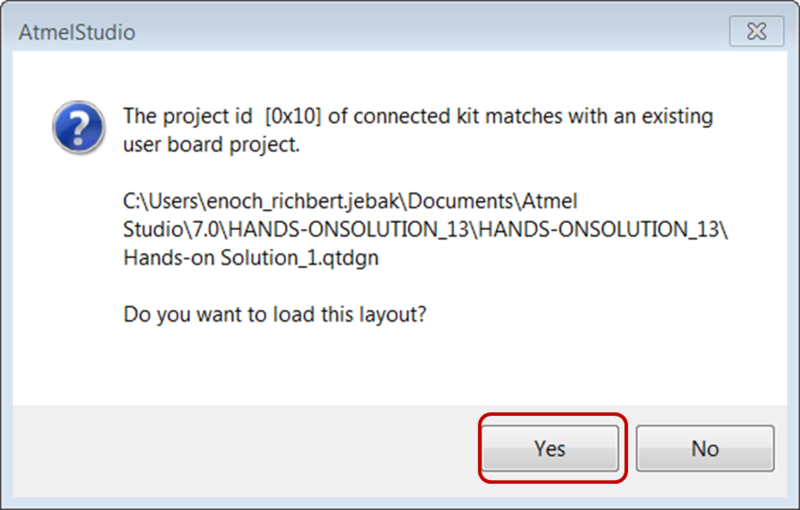 If the project ID of this QTouch project matches an existing project, a pop-up window appears, requesting confirmation to load the layout. Click YES. To verify that your board is now connected, you can check the bottom left corner of the QTouch Analyzer window. Click on 'Signal Selection' and select Signal, Delta, and Reference for Button0. Touch the sensor and observe the change in Signal and Delta. After completing this lab, click on 'Stop Reading.' This will prevent QTouch Analyzer from collecting touch data over a long period of time, which might slow down your computer. The kit is connected to QTouch Analyzer and displays sensor signal, delta, and reference values.